Home gardens throughout the UK have been destroyed. 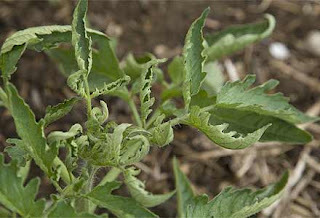 Leaves on tomato plants are curling and potatoes are deformed, carrots, peas, lettuce all deemed inedible and the timing couldn't be worse. Last week it was being reported that people were stealing vegetables right from their neighbors garden because of the increase of food prices. DOW is no stranger to controversy, and judging from their track record they don’t hold human life in high regard. In India they refuse to take responsibility for a poison gas spill, they will not clean it up and they will not provide clean water to the people. DOW is the second largest chemical company in America and they provided napalm to the US during Vietnam, and they are corrupting seeds around the world rolling out more GMO’s (genetically modified organisms). Now this giant can reach into our backyards and uproot our personal food supply. Along with the people in the UK who will not be able to feed themselves from their own gardens, many of us will not be able to get all the food we are used to getting in our markets soon. Right now across the world they are literally flooding out farms, destroying the produce crops for this year. Other parts of the world are being dried out, to the point where crops could never survive like Cyprus where they are importing water. 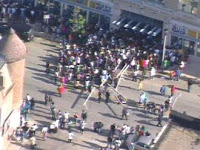 There is a food crisis going on throughout the world, even in America there are people standing in bread lines rioting over food vouchers. The future of food is being set up with disaster in mind. Bill Gates and the Rockefeller foundation have joined forces and begun storing seeds in the Svalbard Global Seed Vault, aka the doomsday vault. Monsanto’s terminator technology could starve us all, seeds that die after one season and that carry a sterility trait that can cross pollinate destroying crops surrounding it. A situation that would devastate the worlds population, a plan that the eugenicists are salivating over. Our food supply is under attack, and we are told the enemy is us. We are told that we have created a warming, but their weapons are advanced, and their skills are sharp, they make no mistakes, manure and herbicides, floods and drought, they all yield the same results.